In 1965, 75 percent of all physicians belonged to the American Medical Association. Today less than 25 percent do. This decline can be attributed to six major issues: technology, generational differences, value expectations, market structure, competition, and time constraints. 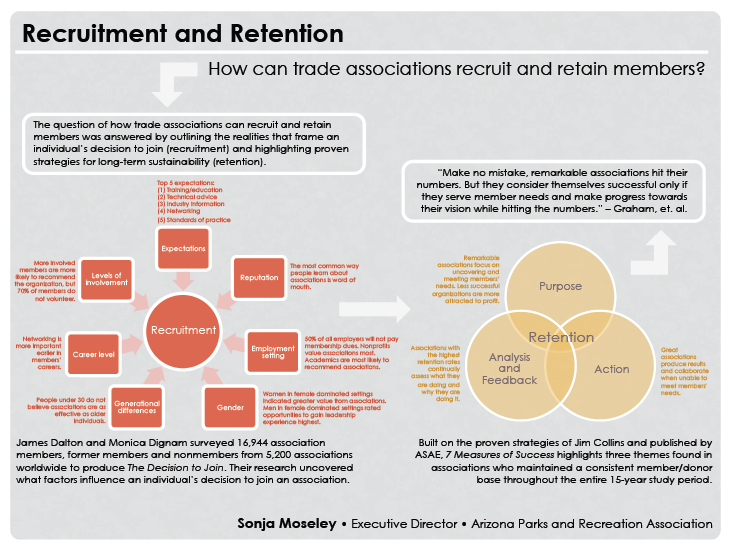 In these challenging times, how can trade associations recruit and retain members? The market is inundated with books, consultants, recommendations and opinions on trade associations. In my experience, The Decision to Join (2007) and 7 Measures of Success (2006) are two must-have books. Both proved especially useful in my role as Executive Director of the Arizona Parks and Recreation Association. Other notable reads are Race for Relevance (2011), Road to Relevance (2013), The End of Membership as We Know It (2011) and The New Recruit (2007). The majority of noteworthy association literature comes from the American Society of Association Executives, which continually proves its worth as a provider of current, valuable information for association professionals.